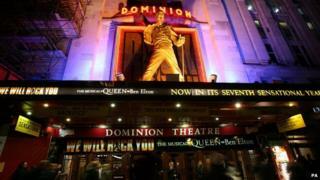 We Will Rock You, the hit musical based on the songs of Queen, is to close in the West End after a 12-year run. The show, which is the longest-running production in the history of the Dominion Theatre, will have its final curtain call on 31 May 2014. Written by Ben Elton, it currently stars Kevin Kennedy, best known as Coronation Street's Curly Watts. On hearing of the closure, he tweeted: "Just when you get all the words right and in the proper places." The show is based around Queen hits such as Bohemian Rhapsody, Radio Ga Ga and Another One Bites The Dust. Critics were never kind to the £6m production, in particular its story - set in a dystopian future where music is banned. When it opened in 2002, the Guardian said the plot "really is as sixth form as it sounds", while the Mirror declared that "Ben Elton should be shot". Even Queen's drummer, Roger Taylor, had his doubts, telling Mojo Magazine the script was "slightly crass", although "it does have its good points". "I do have an aversion to musical theatre, so it hasn't been easy," he added, "but I've learned to live with the musical." Despite the criticisms, the production has been seen by more than 16 million people in 28 countries - and ranks among the top 10 longest-running musicals in West End history. "We want to thank every one of the many hundreds of incredible musical theatre artists, musicians and crew with whom we've had the privilege of working at the Dominion since 2002," said Taylor, Elton and Queen guitarist Brian May in a statement. "And, of course, the incredible audiences who have rewarded them with over four-and-a-half thousand standing ovations." "It has been a privilege to have hosted We Will Rock You for the past 12 years," added David Pearson of the Dominion Theatre. "To have the show rocking the Dominion and seeing a standing ovation night after night has been quite amazing. "We wish the show every success for the future, as we now prepare to accelerate our restoration and refurbishment programme ready to welcome an exciting new production in 2015." The news of the closure comes days after Queen announced a 19-date US tour, with singer Adam Lambert taking the place of the late Freddie Mercury.